For my birthday last year, I wanted nothing more than to dine at Thomas Keller’s 3-Michelin star, James Beard Award winning restaurant, The French Laundry; so Evan took me to Napa for a little weekend getaway. Unfortunately, the same weekend we were visiting coincided with the restaurants’ annual winter break and my poor little, food loving heart was completely crushed. My 30th birthday was totally ruined….okay, it wasn’t ruined….not even close, in fact. The thing about Napa Valley is that it’s as much a food lover’s dream as it is that of a wine lover. There seems to be an endless supply of amazing, award-winning restaurants at every bend. And good ol’ Thomas Keller was kind enough to not only start one fabulous restaurant in Napa Valley, but three! So when The French Laundry was no longer an option, we made reservations at Bouchon and I wasted no time surveying the menu to begin designing my perfect birthday meal. As much as I remember enjoying the entire experience as a whole, only a year later, I can’t seem to remember what I ate that night…well, except for dessert, that is. I’m no stranger to lemony sweets-pies, bars, tarts, cookies, cakes- you name it and I’ve probably had it (and loved it) but there is something so special about the Tarte Au Citron served at any Thomas Keller establishment. Not only is the taste unreal, the consistency of the lemon sabayon (which is more of a custard than a curd) is silky and smooth and pairs so perfectly with the buttery, slightly sweet, slightly salty pine nut crust. I wanted to recreate this delicious confection but I also wanted to put my own spin on it. A few years ago, I tried one of these lemon lavender ice cream sandwiches from Ruby Jewel and it blew my mind. I was in college at the time and my love for food and palate had yet to be developed so this was crazy stuff for me. Pairing lemon with a flower? Say wha?! 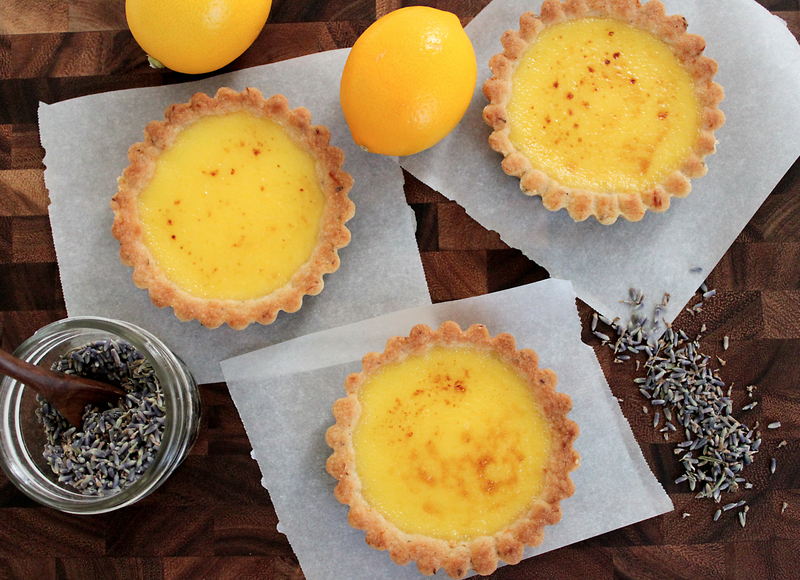 Nowadays, lemon and lavender is one of my favorite flavor combinations, they go together like pb&J in my book. Here’s my take on Thomas Keller’s Tarte Au Citron with a Meyer lemon and lavender shortbread crust. 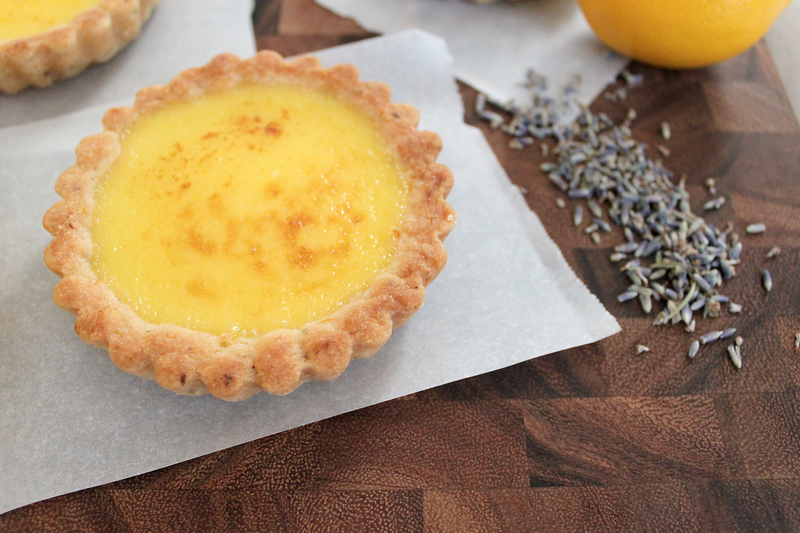 I loved how this tart came out, it was sweet and lemony and totally unexpected. The lavender really delivers a flavor profile that sort of awakens your senses. It’s almost like each ingredient hits you separately, like it’s telling a story or something. I can definitely see myself making this over and over…and over! Recipe after the jump. Enjoy! parchment paper cut to fit the bottom of your tart pans. Mix the sugar with the chopped lavender and grated lemon zest in a medium bowl (or bowl of a stand mixer), beat the butter in at a medium speed until well mixed. At low speed, beat in the flour and salt until a soft dough forms. Transfer the dough to a sheet of plastic wrap and refrigerate for 20 minutes. Roll the dough out onto a floured surface to about 1/4in thick and cut six 5in. circles. Butter or oil the tart pans and place a piece of parchment paper at the bottom of each pan to avoid sticking. Fit the cut dough into each tin, making sure it fills every scallop or crevice evenly. Cut any excess off of the top. Pierce the bottoms of the dough several times with a fork to avoid puffing during baking. Place tart pans on a baking sheet and refrigerate for about 10 minutes. Bake for 20 to 25 minutes, or until the edges are lightly browned. Let tarts cool in their pans. Turn off the heat and leave the bowl over the water. Whisk in the butter a piece at a time. The sabayon may loosen slightly, but it will thicken and set as it cools. Pour the warm sabayon into the tart crusts on a baking sheet. Preheat the broiler. While the sabayon is still warm, place the tarts under the broiler. Leaving the door open, brown the top of the sabayon, rotating the tarts if necessary for even color; this will take only a few seconds, so do not leave the oven. Remove the tarts from the broiler and let it sit for at least 1 hour before serving. Serve at room temperature or cold. Note: I had leftover shortbread dough and sabayon. I rolled whatever dough I had into a small log and wrapped it in plastic wrap and refrigerated. I put the sabayon in a small mason jar (also placed in fridge). A day or two later, I cut the shortbread log into 1/4″ thin rounds and baked them up for about 10 minutes. I served them with a heaping dollop of lemon sabayon and a freshly steeped cup of tea. Delicious! ****I would like to warn that from my findings on Google and such, you probably shouldn’t keep the sabayon for too long. I threw mine out after five days even though it still looked and tasted amazing. Those tarts look so good! … and btw, you should check out the Restaurant at Meadowood in St helena. Its pretty good. Thank you so much! They were delish…I wish I could have one now!!! Thank you for the restaurant recommendation! We’re hoping to head up to Napa sometime this spring or summer so it’s perfect timing! xoxo! I’ve been searching for recipes to use lavender with… this looks perfect! Thanks for sharing! Wow, these look so good! I can imagine how wonderful the combination of the lavender shortbread crust with the sweet lemon filling. Love it!